This is a very nice bra. 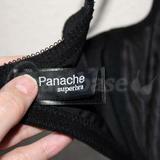 This is the only Panache that I have tried that doesn't dig into my sternum, which is great. It fits me all over, however I don't like the shape it gives me under clothes. It's too east/west for me. I do wish the fabric was softer.